Spectrasonics’ major keyboard collection combines classic vintage instruments with a gallery of unique rarities. There’s something reassuringly solid about Spectrasonics. Based in Burbank, California, the company has been outputting state-of-the-art products since 1994, when co-founder Eric Persing released the ground-breaking Bass Legends library (chunks of which live on under the hood of certain keyboard workstations). Having successfully navigated the format upheavals of the hardware sampler era, Spectrasonics scored with their acclaimed Stylus, Trilogy and Atmosphere virtual instruments before hitting the jackpot with Trilian and the multi-award-winning Omnisphere synth, voted SOS readers’ Best Software Instrument in 2014, 2015 and 2017. While technical innovation and sonic exploration have been a company hallmark from the start, Persing’s background as a session player and producer adds an important dimension to the story. This hands-on studio experience, coupled with a lifelong love affair with keyboards, helps account for Spectrasonics’ instruments being so playable and practical. It also explains the motivation behind the company’s latest offering, which looks set to create a new standard for vintage keyboard collections. 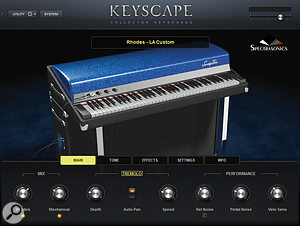 Spectrasonics’ Keyscape comprises no fewer than 36 keyboard models, ranging from iconic, sought-after ’70s instruments to contemporary retro-styled keyboards. An intriguing selection of hitherto-unsampled historical rarities is also included, along with a leading make of 20th-century concert grand piano. There are no organs or analogue synths in this collection, nor are there any licks or phrases: the focus is squarely on multisampled electro-mechanical and acoustic instruments, augmented by a handful of digital ’80s classics such as the ubiquitous and unashamedly synthetic ‘FM Rhodes’ sound. Lossless audio compression reduces the large sample database (over 200GB in size) to a more manageable 77GB on your hard drive. You can install either the full 77GB collection or an optional 30GB ‘Lite’ menu of essential instruments designed for live performance. If you wish, you can run the full version in your studio DAW and use the Lite install on a laptop at gigs. The Lite version is not sold separately, and since many patches reference multiple parts of the library, you can’t install your own personal selection of instruments. 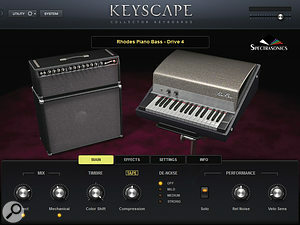 Keyscape is formatted exclusively for Spectrasonics’ STEAM sound engine, which runs as a plug-in on Mac and Windows systems in all the major DAWs and 64-bit plug-in hosts that support VST/AU/AAX platforms. It’s important to note that while 32-bit hosts aren’t supported for Keyscape, its full panoply of sounds and patches can be loaded into Omnisphere 2, which will operate in a 32-bit host. As well as making Omnisphere’s numerous effects and sound-design features available for Keyscape instruments, this facilitates creative layering of patches from the two libraries. Keyboardists who have played the real thing (such as myself) often say that sampled emulations don’t quite nail the Fender Rhodes sound. This is understandable given the instrument’s wide dynamic and sonic range, but there’s a more serious underlying issue: vintage electro-mechanical keyboards need regular servicing, and the expertise to reach inside the piano and correct clunky, buzzy, over-quiet, thin-sounding or out-of-tune notes is something they don’t teach on music tech courses. Consequently, some sampled versions display imperfections that would be unacceptable to an experienced Rhodes player. Happily for all concerned, Spectrasonics care about such things and, being based in Southern California (birthplace of the Rhodes), were well-placed to draw upon a wealth of local expertise when it came to locating and restoring vintage models. 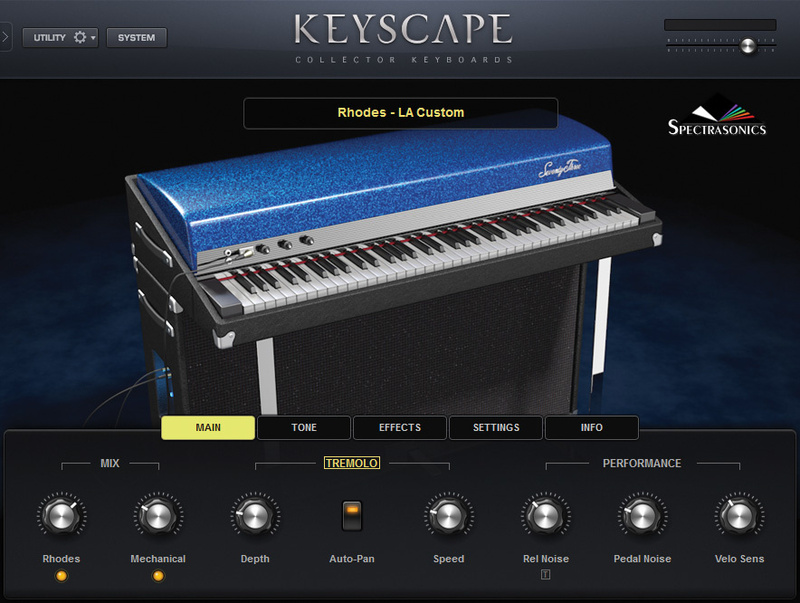 A stellar example is Keyscape’s ‘LA Custom Rhodes’, a 1974 73-key Fender Rhodes Suitcase which epitomises the legendary ‘E’ sound perfected by LA keyboard tech Eddy Reynolds in the ’70s and ’80s. Reynolds’ modifications to the preamp circuitry, action and voicing produced a fat, bright, full-toned sound which was hailed by inventor Harold Rhodes as the best he had ever heard. Having tracked down one of these rare souped-up beasts, Spectrasonics did a great job sampling it: the instrument combines a brilliant, bell-like attack with a rich, warm yet clear sustain, responding to subtle variations of touch with timbres ranging from soft, confidential tinkles to a strident twangy snarl. Blessed with a sound that positively leaps out of the speakers, this stunning, superbly playable and authentic instrument raises the bar for multisampled Rhodes pianos, and strikes me as being as close to perfection as we’re likely to get. Keyscape’s pride and joy: the ‘LA Custom Rhodes’, featuring the legendary ‘E’ sound perfected by keyboard tech Eddy Reynolds.If one outstanding electric piano isn’t enough for you, you’ll be pleased to hear that Keyscape has more examples up its sleeve. Its ‘Classic Rhodes’ patches feature an immaculately restored, early-’70s Mark I Suitcase model recorded directly from its preamp. (Trainspotters’ corner: the GUI info tab says it’s a 73-key instrument, but the version depicted on the GUI has 88 keys.) Though less tonally sparkling than the above-mentioned LA Custom, the Classic Rhodes shares its bright, well-defined bell attack and full tone, sounds great and plays beautifully. ‘Classic Suitcase’ patches feature the same performances recorded via the piano’s built-in speakers, giving a plummy, bassy and mellow tone which would suit smoky, retro-flavoured jazz ballads of the Donald Fagen variety. Joining these 1970s gems is a contemporary Vintage Vibe Electric Piano, a Rhodes clone hand-crafted in the USA since 2011 and endorsed by luminaries such as Stevie Wonder, Greg Phillinganes and Robert Glasper. Keyscape’s deeply sampled reproduction is the official software version: its distinctive ‘tappy’ percussive attack guarantees good rhythmic definition, and its pleasantly upfront, clean, modern tone is a nice alternative to the familiar Rhodes timbres of yesteryear. Another welcome inclusion is the Rhodes Piano Bass, a cut-down version covering the lowest two and a half octaves of the 73-note instrument. This early Rhodes product was famously played by Doors keyboardist Ray Manzarek in the ‘60s, but a revival is long overdue: its ‘Dark’ patch would make an excellent, booming EDM bass sound, and adding the built-in ‘drive’ effect gives it a great, angry edge for aggressive rock productions. Vintage Vibe’s contemporary take on the instrument, the Tine Bass, is also a cool timbre: it sounds not unlike a bass guitar, and can do a passable impersonation of an acoustic double bass. Alternatively, select the Big Muff distortion effect, turn up the treble, and you’re into the classic, scorching fuzz bass sound that enthralled the ’70s prog community. In the same category are a pair of rare and historic tine-based instruments. Made in the 1960s by an East German accordion manufacturer, the battery-powered Weltmeister Basset 1 can claim to be the world’s first keytar: it’s basically a strap-on keyboard with a neck extension housing a big button for adding (I think) vibrato-like volume fluctuations. The Weltmeister Basset 2 is the tabletop, neckless version of the same thing. Both have an admirably thick, thunky, confrontational tone which would pass for electric bass in a mix, but when played in isolation you can hear the faint metallic twang of the vibrating tine adding a unique and esoteric character. 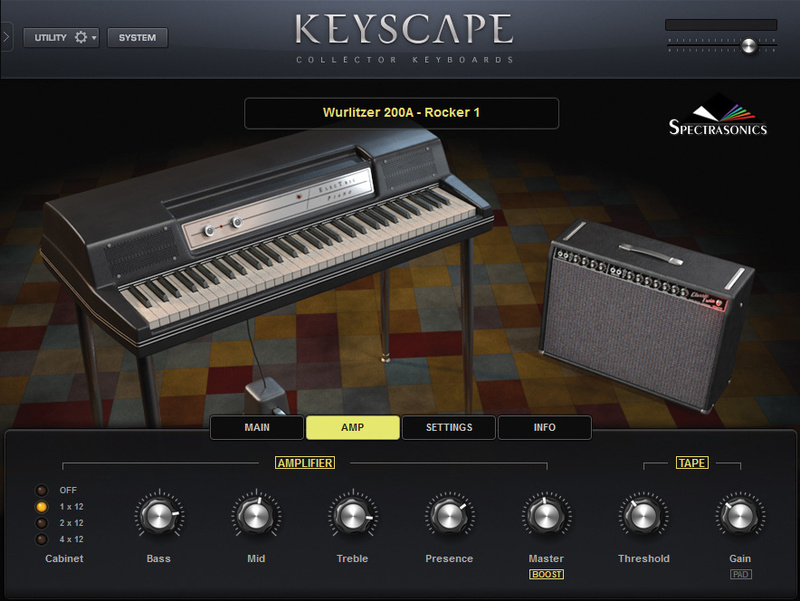 Get your left-hand bass lines going with the Rhodes Piano Bass, another ’60s favourite.From Rhodes to reeds... the plump, friendly tone of the Wurlitzer electric piano, a standard fixture in vintage keys collections, is beautifully reproduced in Keyscape. Its familiar sound, created by piano hammers striking a flat metal blade (aka reed), consists of a pleasant, mellow chime which turns into a stroppy bark when played loud. Spectrasonics recorded both the Wurli’s built-in amp and speakers and its direct jack output. They also emulated the original mono vibrato, which (unlike the original) can be switched to stereo auto-pan. There are two models: the popular Wurlitzer 200A’s patches feature modelled vintage amps which add suitable angst and bite, though I preferred to wallow in the pure, soft, harp-like tone of the instrument. The rare 1950s 140B model featured on the Ray Charles hit ‘What’d I Say’ has an even sweeter timbre, and owes its immaculate sound to a meticulous restoration job. Though less fashionably retro, the Hohner Pianet is another idiosyncratic reedy timbre that’s made an indelible mark on pop history — any keyboard to appear on both ‘I Am the Walrus’ and ‘She’s Not There’ is all right with me. Keyscape includes three Pianet types: the mid-’60s ‘N’ model definitively nails the instrument’s iconic sound, while the late-’70s Pianet M offers a somewhat brighter timbre. By contrast, the subdued tone of the Pianet T is reminiscent of a Rhodes Suitcase with the treble rolled off, minus the Rhodes’ sustain and dynamic variation. Only one gripe: though agreeably distorted, the Pianet N ‘Fuzz Face’ patch lacks the sheer brutal nastiness of the real thing. I used to play my Pianet through an Arbiter Fuzz Face pedal and 100 Watt stack, and the resulting savage, ear-shredding racket could empty an auditorium in seconds. Another esoteric slice of electric piano history is the Weltmeister (that name again) Claviset, marketed in the UK in the 1960s as the wonderfully named Selmer Pianotron. Its metal reeds are plucked by rotating rubber discs, creating a plunky, tonky percussive sound with plenty of attack but little sustain. By no stretch of the imagination could it be described as lush, but it has a certain period charm and bags of character. Keyboard nerds (I use the term affectionately) will tell you that Stevie Wonder’s ‘Superstition’ part was played on a Hohner Clavinet C model, rather than the more common Clavinet D6. 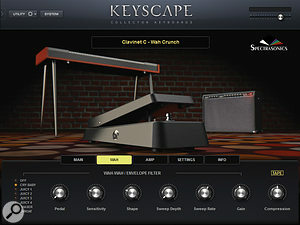 While I’m sure it would have sounded great either way, my inner geek was excited to learn that Keyscape’s Clavinet is in fact the rare C model, which techs say benefits from simpler preamp circuitry. I had an indecent amount of fun playing this instrument, starting with chordal improvs inspired by its lovely long, super-clean guitar-like sustain, but soon descending into the raving fuzz-wah territory at which this Clavinet excels. If you want to rock out, a number of different overdriven amp and wah models (including Talkbox-like formant shifting) are provided, some of them intensely raunchy. 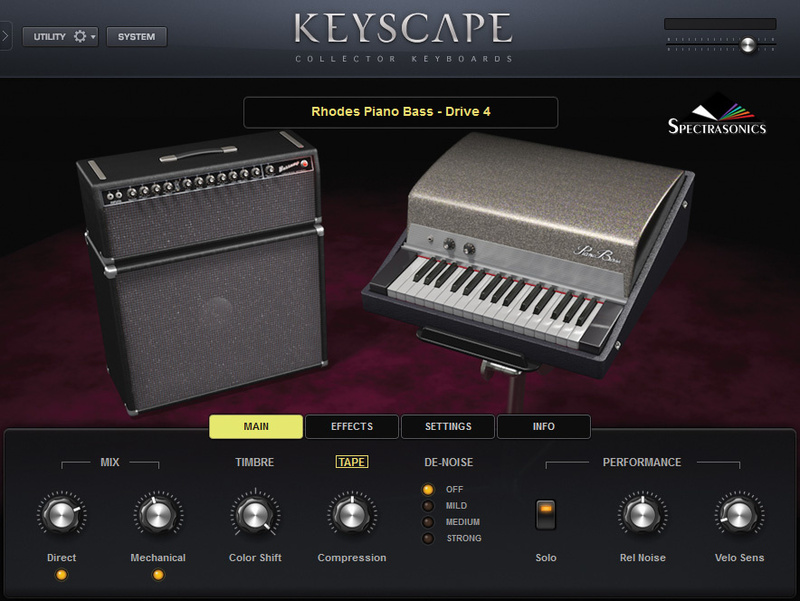 Keyscape also contains a Clavinet-Pianet Duo, an ambitious concoction which fused a Clavinet E7 and a Pianet T into a single playable unit. You can access the two sounds separately and blend them to taste — I found that subtly mixing in the Pianet adds warmth and bottom end to the edgy Clavinet timbre. Patches featuring the Clavinet’s mute sound have good rhythmic potential, and funkateers can get down with their bad self (assuming their good self doesn’t object) and go bonkers with the auto-wah effects. For more info on these instruments, I recommend Huw Rees’ excellent article ‘Ernst Zacharias & The Hohner Clavinet’ (SOS June 2016). Further proof of the Clavinet’s staying power comes in the shape of a latter-day emulation called the Vibanet, made by (you guessed it) Vintage Vibe, whose technicians played a vital role in restoring Keyscape’s instruments. First issued in 2014, this is a high-tech facsimile of a classic instrument, and the virtual instrument version included here sounds tremendous — pristine, super-sustaining and filthy when required, like a Clavinet on steroids. Some Clavinet patches include raging wah and overdrive effects — handle with care.Though less immediately recognisable, an electric keyboard in the same sonic ballpark also made an impression in the mid-’60s: the Baldwin Electric Harpsichord, famously played by George Martin on the Beatles’ ‘Because’, championed by UK band Spooky Tooth and often used in TV and film themes of the era. This classic pop keyboard timbre was revived by Jellyfish in the ’90s. Whether used ironically as a knowing period reference or seriously as a contemporary keyboard timbre, its muscular, pure, steely tones still sound absolutely fab. A library of this type needs a good piano, and I’m pleased to report Keyscape has one in its locker: a Yamaha C7 grand, built for the concert stage and flagship of the company’s Conservatory Concert Collection range. This seven-and-a-half-foot beauty is my preferred choice for acoustic piano sessions, both for its hallmark clarity of attack and for its tonal consistency from instrument to instrument. This piano’s sound defaults to open and fairly bright, with 21 patches covering a range of styles from straight, dry studio presentations to lush cinematic washes. Use the ‘Softest’ patch for sensitive ballads, or load the hard-as-nails ‘Unreal Smash’ for melodramatic, crashing, heavy-rock bass accents. A highly effective EQ section is available for further tweaking. Those who prefer a more ambient ‘classical’ piano sound may not appreciate the close miking, but I find it ideal for all manner of productions. Whatever your taste, this is unarguably a handsome-sounding, characterful, versatile, ultra-dynamic and playable piano of the highest quality. For occasions that demand a less formal piano sound, you could give Keyscape’s Wing Upright Piano a whirl. Considering its age, this 116-year-old instrument has a surprisingly full and sustaining tone and it sounds remarkably tender when played quietly, though the lyricism is compromised by some tappy-sounding high notes. A honky-tonk patch with controllable detuning makes a lovely, autoharp-like timbre, and the colourful, cleverly programmed ‘Octave Stereo’ and ‘Sixties Mute’ patches are great timbres for left-field soundtracks. Wurlitzer’s popular 200A electric piano — this patch includes a vintage modelled amp.The honky-tonk effect intensifies with the bright, jangly metallic attack of the Wing Tack Piano. The effect is usually created by inserting brass tacks in the striking surface of the hammers, but in this instance it’s achieved by the less damaging technique of suspending small metal rings between the hammers and the strings. Media composers will have fun with the ‘Slow Tremolo’ and ‘Desolate Tremolo’ patches, the latter a spook-tacular, haunted-house ‘piano in the attack’ noise with Eastern European cimbalom-like overtones. Returning to more familiar and earthly territory, the Yamaha CP-70 Electric Grand is another 1970s classic. Though I played this instrument on stage in the 1980s, it never stole my heart, but there are some (among them Peter Gabriel, Tim Rice-Oxley of Keane and King Crimson’s Jakko Jakszyk) who love it. Whatever your view, it does have a unique and utterly distinctive sound which is reproduced here in admirable clarity. Keyscape’s excellent sampled effort is the tonally brightest I’ve heard, and packs a great set of transformative echo and chorus effects. 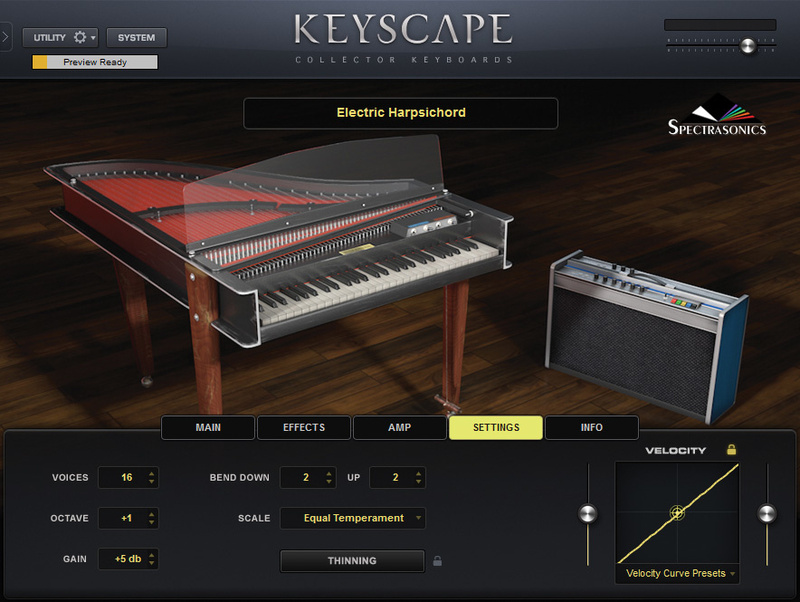 In addition to covering the Rhodes/Wurli/Clavinet vintage-keys extended family in depth, Keyscape has a great line in historic acoustic keyboards, some of which have never appeared in sampled form before. You’ll know the celeste from Tchaikovsky’s ‘The Nutcracker’, and may have heard Jacob Collier playing it to great effect at the August 2016 Quincy Jones Prom. Recorded with close and room mics and via its original 1940s pickup, Keyscape’s specimen sounds absolutely exquisite, its pure, high-pitched bell-like tones enhanced by lush echo and tremolo effects which impart a floating, ethereal vibraphone-like flavour. A standout instrument. Invented in 1860 and an immediate forerunner to the celeste, the Dulcitone makes its eponymous sweet chiming sound via felt-covered wooden hammers striking a set of tuning forks. A surfeit of annoying keybed thumps can be removed with a low-cut filter, revealing a pretty, celeste-like tone. By the simple expedient of adding masses of long reverb, patches such as ‘Soaked’ highlight the instrument’s atmospheric soundtrack potential. The steely tones of the Baldwin Electric Harpischord featured on many ’60s records and film scores.Not to be confused with the Clavinet (which it predates by some 560 years), the clavichord is a late-Medieval European stringed keyboard instrument with a quiet, somewhat percussive and unrefined sound created by small metal blades striking the strings from below. 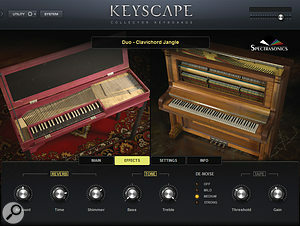 Heard in its unadulterated state, Keyscape’s handcrafted clavichord won’t cut the mustard on any sane pop session, but taking another tack, its turbocharged ‘Epic Cinema’ patch sees it transformed into a huge, end-of-days, twanging sub-bass noise which would light up the eyes of a horror film director. 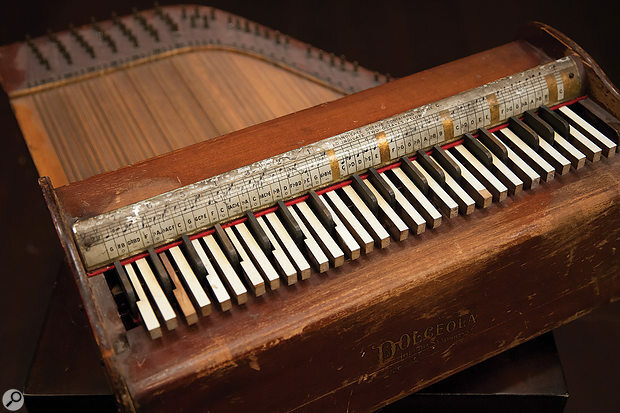 By contrast, the Dolceola (a cheap and cheerful, early 20th-century keyboard-activated zither) has a sweeter, folksier, almost koto-like tone. Its usefulness is compromised by some clunky mid-range notes and its D2 pitch is too quiet — the solitary, minor programming oversight I managed to find in this vast collection. In a class of its own is the 1960s Harmochord harmonium, which dispenses with traditional pedal power and instead uses a modern invention called ‘electricity’ to blow air through its reeds. This rich, deep and mellow reed organ works very well for song accompaniment. Alternatively, you can use its octave-coupled patches for accordion-like lead lines, or dial up the amazing, heavily tweaked ‘Dronescape Deep’ patch for deranged psychedelic sound-design excursions. A trio of 20th-century digital instruments bring us full-circle back to Spectrasonics’ co-founder’s early career. The MKS-20 Digital Piano, developed by Eric Persing in his former gig of Chief Sound Designer for Roland Music, won plaudits for its organic, easy-on-the ear electric piano sounds. These are carefully replicated in Keyscape, along with a very nice vibes patch and a decent CP-70 Electric Grand emulation. Also included is the late-’80s MK-80 Digital Rhodes, decried at the time by traditionalists who resented the grafting of the Rhodes name onto a synthetic digital instrument. (I can see their point, and so too could Harold Rhodes, who apparently hated it.) Such grievances aside, the MK-80’s bright, tinselly tone could come in handy as the ‘fairy dust’ layer in a composite keyboard sound. The third of Keyscape’s ‘vintage digital’ offerings is the JD-800 ‘Crystal Rhodes’, a polished, pleasantly tinkly factory patch created by Persing which became a fixture in ’90s pop. Hybrid Duo patches feature the combined sound of two keyboards, creating some unique sounds. 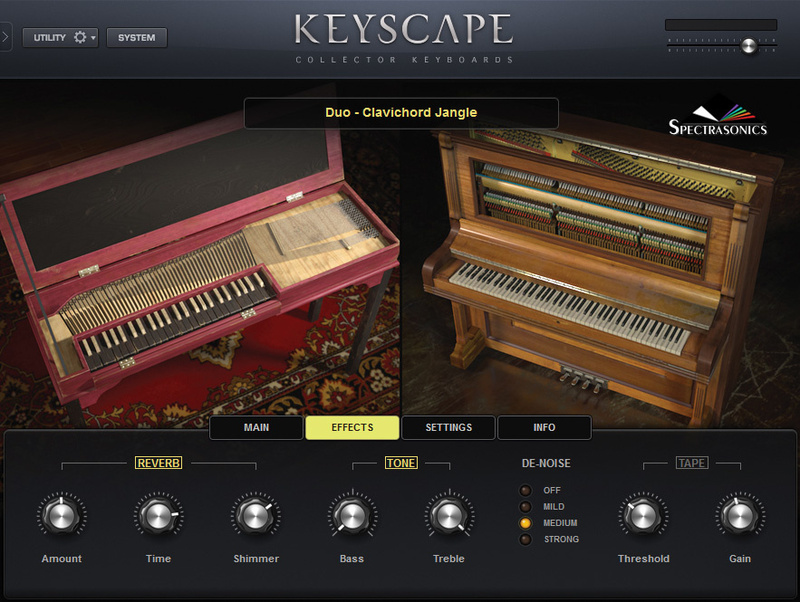 Shown here: clavichord and Wing upright piano.Keyscape provides multiple presentations of each of its 36 instruments, giving users a grand total of 450 patches. Twenty three of them are hybrid ‘Duo’ patches which illustrate the creative possibilities of layering a pair of complementary instruments (for example, grand piano and clavichord). You can customise a patch’s numerous controls and effects and save the results as a user patch. However, as is often the case with virtual instruments, you can’t perform edits at sample level. Many of the library’s electric pianos feature the miked mechanical sound of the keys, which can be added to the main samples to add realism or increase the attack. In the same spirit, sustain pedal noises are included as a separate layer, while release triggers are employed throughout. I felt the volume level of the release samples often bordered on the intrusive, but depending on your taste they can easily be turned down, up or off. There is a perception that old keyboards, like wine, get better with time. Unfortunately, it’s wrong: like the human body, ageing instruments suffer from bits falling off, loss of function, poor co-ordination, stiffness and general decrepitude, and so need regular doctor’s visits to remain operational. Given that, we should count ourselves lucky that a company has taken so much time (10 years, apparently) and trouble to restore an unprecedentedly large collection of vintage instruments, some of them well over 100 years old, to a state of vibrant musical health. As you can probably tell, I think Keyscape is a magnificent, authentic, definitive and inspirational library which is unlikely to be surpassed in my lifetime. All these great, classic sounds, with none of the blemishes — a keyboardist’s dream, and a brilliant resource for producers and composers of all stripes. 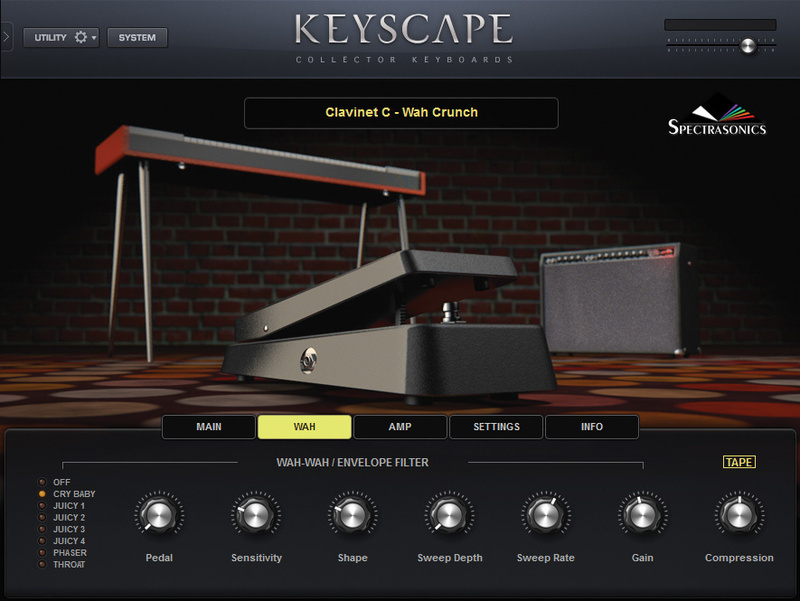 Rather than providing a standard set of effects for all instruments, Keyscape supplies special controls and effects processors tailored for each patch. These include effects typically paired with the keyboard model in question, so you’ll find stereo tremolo and phasers for electric pianos, wah-wah for clavinets, chorus for vintage digital sounds, etc. Amp models for electric instruments are similarly matched: for example, some 1970s Classic Rhodes patches feature a modelled Fender Twin Reverb amp. Vintage distortion pedals such as the Electro-Harmonix Big Muff and Arbiter Fuzz Face have also been analysed and replicated. Evoking the glory days of poor-quality audio, some instruments have a nicely distressed lo-fi option (one even includes vinyl crackling), and there’s a cool, non-vintage Color Shift knob which messes with the instrument’s harmonic structure. Overall, the effects menus are carefully chosen to provide the most useful parameters for each instrument: what you can’t do is (say) add wah-wah to a celeste, but your audience will thank you for that (although users of both Keyscape and Omnisphere 2 can open a Keyscape patch in Omnisphere and add Omnisphere’s wah-wah to the patch). While I can live without the vertigo-inducing stereo tremolo implemented for the electric pianos, I loved the chorus and reverb effects, which transform the dry Rhodes samples into lush, magical, sparkling stereo soundscapes. I wish a stereo delay had been included throughout, but that effect is a standard plug-in in all DAWs (and in Omnisphere). Effects can easily be turned on or off, and you can create your own settings and save them in a user patch. * Included in ‘Lite’ install option. If you’re in the market for a toy piano, you’re spoiled for choice in this library. Keyscape has four, ranging from the archetypal childish plinky-plonk of the so-called ‘Grand’ and ‘Classic’ models to the esoteric tones of the ‘Bell Saucer’ and ‘Glock’ instruments, which use, respectively, a bell tree and miniature metal bars as their sound sources. The 1946 electric Rhodes Pre-Piano, handmade by Harold Rhodes with piano students in mind, also has a toy-piano-like sound. In a similar vein, Wurlitzer’s 44-key Mini Student Butterfly Piano was designed for children to play, but has a more grown-up, recognisably pianistic tone. Both of these rarities have been lovingly restored, a testament to the makers’ commitment to rare historic instruments. Keyscape’s minimum requirements for all users are 8GB of RAM and a 2.2GHz Intel dual-core processor or higher. The full version requires 80GB of free hard-drive space, while the ‘Lite’ install needs 30GB. For optimal sample-streaming results, Spectrasonics highly recommend a solid-state drive. Mac users need OS 10.9 Mavericks or higher, AU, VST 2.4 or AAX-capable host software. Windows users need Windows 7 or higher, VST 2.4 or AAX-capable host software. Both platforms require a native 64-bit host to run Keyscape. However, Keyscape patches can be played within Omnisphere 2, which will operate in 32-bit hosts. 36 meticulously sampled keyboards in one package is a hell of a good deal. Contains some of the best vintage keys multisamples you’ll hear. Rare historical instruments add some great, esoteric timbres. Integrates seamlessly with Omnisphere 2. The sheer, head-spinning number of creative options can cause dizziness. Brought to you by the makers of the Omnisphere 2 synth, Keyscape is a collection of 36 vintage, contemporary, retro and rare historic keyboards (including a modern concert grand piano), all lovingly restored by specialist technicians. The library contains no organs, analogue synths, licks or phrases, but don’t let that put you off: the quality, diversity, playability and creative potential of the included instruments is staggering. Spectrasonics Keyscape boxed £285, Keyscape download $399. Prices include VAT.